Japan’s soccer team recently received worldwide praise, not for a victory, but for their behavior at the AFC Asian Cup 2019. Despite a heartbreaking loss to Qatar at the tournament’s final game on Friday, members of the Japanese soccer team displayed their discipline and politeness by leaving their dressing room completely spotless. They even left a message thanking the stadium staff in three languages: English, Arabic, and Japanese. The Asian Cup staff noticed the gesture and images of the spotless dressing room and posted it on the AFC Twitter account. According to Soranews24, the team’s “classy gesture” earned praise from international netizens. “Japanese players and fans are well behaved and respected all around the world for their good gesture,” a commenter noted. “I love Japanese players and their fans. 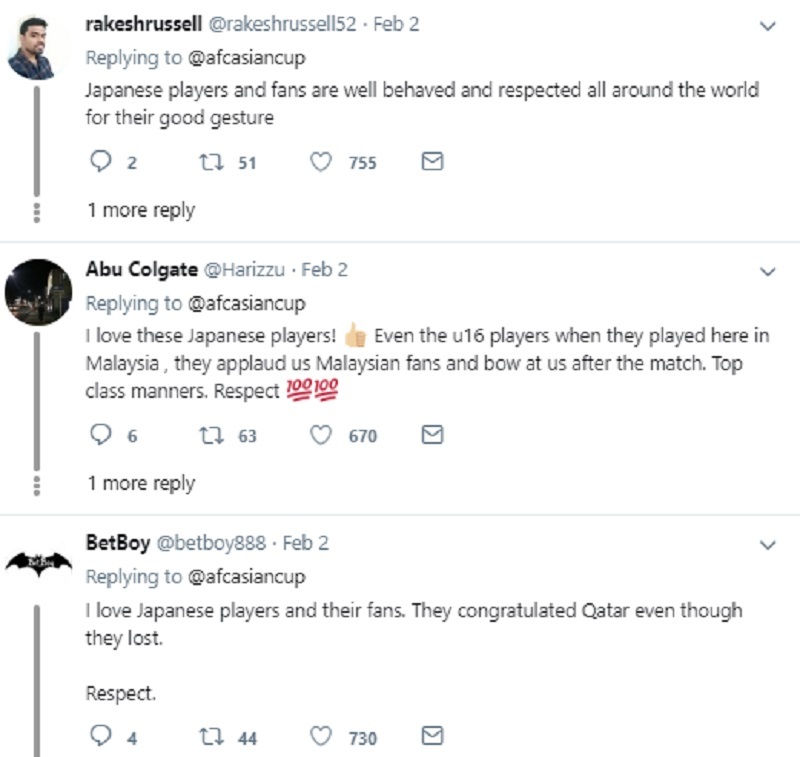 They congratulated Qatar even though they lost. Respect,” one Twitter user wrote. “One of the most beautiful things I saw today on Twitter,” another chimed in. Japan’s reputation for cleanliness at sporting events has made global headlines before. In 2014, Japanese fans earned the admiration of the world for cleaning the stands at the Brazil World Cup. Such behavior was seen again at last year’s World Cup in Russia, where even fans of the opposing teams were inspired to do the same. At the event, Japan’s national team also cleaned up their dressing room and similarly wrote a “thank you” note written in Russian. #SAYONARA: This is the #Japan team’s dressing room after they lost to Belgium in the 94th minute at the #FIFA World Cup. They even left behind a note with “thank you” in #Russian.